Among the glamorous and influential fashion hubs of the world, Haiti may not be an obvious contender. But the Caribbean nation, famed for its vibrant art, is home to a bold and progressive slew of designers on a crusade to turn that around. 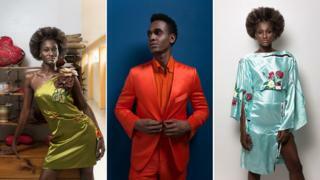 The burgeoning industry is epitomised in the annual Haiti Fashion Week which this year will mark its sixth edition. From the brilliant hues of the pervasive voodoo religion to the shapes inspired by indigenous dance, Haiti’s rich culture is woven into the fabric and forms of the garments. And that, says eminent designer and Fashion Week coordinator Michel Chataigne, makes them unique. “Haiti’s fashion is very different from other countries’ – it’s about colour and volume with lots of ruffles,” he tells the BBC. “People are becoming more familiar with it through Fashion Week which now attracts people and press from all over the world. Designers from Italy, Paris and the US come to see the shows and take part. Traditionally, Haiti’s clothing market has been focused on low-end commodity apparel, a key export, and the sweatshops that churn it out tend to garner more headlines than the country’s sartorial innovation. But Haiti is slowly making a name for creativity, diversity and even sustainability in the field with a previous Fashion Week theme centring on ecologically responsible materials. Mr Chataigne’s own collection incorporated banana leaves and natural tones. One man who has been at the forefront of the scene for two decades is David André who specialises in resort wear for men and women, couture gowns and stand-out showpieces. Born in Port-au-Prince to parents who owned a clothing store, Mr André dreamed of a career in fashion since he was a child growing up inspired by greats like Gaultier, Versace and Lagerfeld. He later studied his craft at a local school before heading to Paris to learn draping and pattern-making. “I love to create new concepts, to play with fabrics and colours. It’s pure pleasure to wake up in the morning and go to work with so much passion,” he continues. While Mr André has a solid client base of young middle-class professionals and niche boutiques, he acknowledges his garments are beyond the reach of ordinary Haitians. “The new generation of young people want to look good, to have new stuff to wear, but the public’s lack of purchasing power prevents the industry from prospering fully,” he concedes. Haiti’s poverty is well documented and many Haitians resent the ubiquitous superlatives applied to illustrate it. Less publicised is the gaping disparity. Haiti is ranked fourth on the CIA World Factbook for income inequality with the richest 20% of people holding almost two-thirds of the country’s total wealth. Still, industry growth is being spurred, Mr Andre says, by emerging talented designers who remain resourceful even in the absence of ready access to quality materials, equipment and reliable electricity. Mr André’s own collections come to life in his purpose-built workshop which aims for 100% local production, from concept to rack. “The fashion industry offers an opportunity to create much-needed jobs in Haiti, along with a venue to show the world what Haiti is capable of,” he adds. Self-taught designer Vladimir Aneas, 30, has an additional obstacle to overcome. Not only is he battling to raise funds to craft his pieces and get his work recognised, he must fight the stigma of being deaf too. Like Mr Andre, his business is based in the well-heeled capital city suburb of Pétion-Ville where this year’s Fashion Week, slated for early November, will be staged. Competition is heightened by the prevalence of “pepe”: donations from overseas of second-hand, often brand-label, clothes sold cheaply on street stalls. Nonetheless, after being hard at work for 10 years, Mr Aneas is determined to realise his goal of appearing at Haiti Fashion Week for the first time this year. “For me, it is the greatest activity in which to participate,” he says. The event arose amid the ashes of the devastating 2010 earthquake, from which recovery is still ongoing, exacerbated by subsequent natural disasters. A group of Haitian designers who lost everything to the catastrophe were invited to take part in a benefit fashion show in the Bahamas that same year, paving the way for a homespun counterpart to evolve. Previous articleSouth Africa: How common are xenophobic attacks?